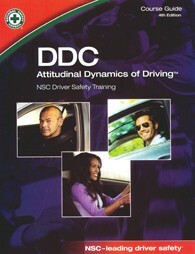 Attitudinal Dynamics of Driving (DDC-ADD) is a highly effective course that helps problem drivers make direct connections between their attitudes and their behavior behind the wheel. They’ll see that the choices they make have very real costs – financial, legal, and personal – and learn to take responsibility for their actions. ADD meets the Nebraska Department of Motor Vehicles' requirements for an alcohol education class. This course does not meet requirements for traffic citation dismissal (STOP Program). Click here to sign up for a STOP class.